Spruce/hemlock forest rises behind the cabin, and the property adjoins Oswald West State Park. This cabin sits atop a cliff above the ocean. Waves crash and break on the rocks below and the view is breathtaking. There is a telephone for local calls. Long distance calls require a calling card, or a cell phone. Cell phone reception varies by carrier, but most phones work somewhere on the property. Although some rooms have electric heaters, for full comfort in the winter, guests should be prepared to heat with wood. There is a supply of dry firewood in the carport. Guests are asked to buy their own firewood for beach or backyard fires. well equipped kitchen, gas stove, microwave, toaster, coffee maker, no dishwasher. Great library for all ages. Deck with fabulous view and child safe railing. Great for whale watching! Outdoors and very private tub, on deck overlooking ocean. As required by county regulations, the hot tub has a safety lock which guests can use or remove during stay. Beautiful views, calm, private and restorative! We absolutely adore staying with you! 10 years ago my wife and I were engaged on the rocks below the cabin... and ever since have made an annual tradition to return. Thank you as always for the most charming cabin on the coast! Wow-the views were phenomenal! Add wine, fresh seafood on grill, w/soak in hot tub & it is perfect. Can’t beat the views and close location to Cannon Beach, Haystack, amenities, and restaurants. Loved bird watching, star gazing, and observing the weather patterns on the water. The cabin is rustic and older but has everything you need. If you are going to grill, be sure to buy charcoal and lighter fluid. Amazing experience with fantastic views and crashing ocean waves. Our stay at this rustic cabin was nothing short of fantastic. We enjoyed every minute of it! Whether we were watching the waves crash on the shore from the hot tub or enjoying a quaint Thanksgiving dinner in front of the wood stove this property helped us to create some amazing memories. We took some time to venture down the road to the Short Sand Beach trails and explore the old growth rainforest, beach and coastal streams. Another amazing experience. We can’t wait for our next stay here. Well appointed and charmingly rustic cabin with a spectacular view. 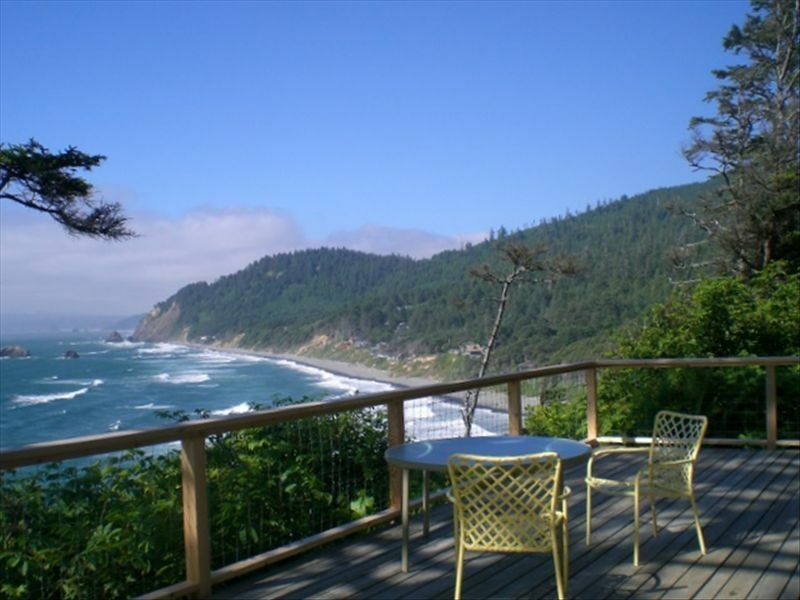 Quiet and secluded setting perched over the wild Oregon Coast. The view that can not be beat! The view!!!! I can’t get over the view! We watched whales for 12 hours! Sit in the hot tub and enjoy the view! You can’t beat it! Absolutely incredible experience! I can’t thank the owners enough for sharing this beautiful home with the world! We are sooo lucky to have experienced it! The cabin is within walking distance of the Oregon Coast Trail that leads north to Arch Cape or south to Oswald West State Park. When the gray whales are migrating along the coast (winter and spring) careful watchers can see their spouts from the deck. Guests may pay either in one payment or two. Please request two payments if that is your preference. Guests may pay by credit card or e-check through Reservation Manager, or by personal check to me. There is a fee of $15 per night for dogs.